Our products are subject to process of on-going improvement. 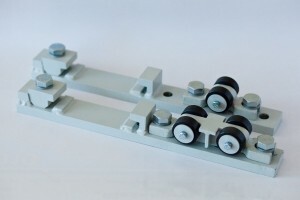 In order to meet this challenge, we organised the Research & Development Department, the task of which is to supply new technical solutions concerning subassemblies or complete products related with systems of railway surfaces. Closely cooperating with the Engineering, Manufacturing and Quality Control departments, employees of R&D Department have a complete overview of the contemporary manufacturing processes. This allows for their stable planning, preparation and implementation. The effects of these operations are tangible, and this position on our corporate website is supposed to present new constructions and materials introduced in our production process, in field testing or in mass production. 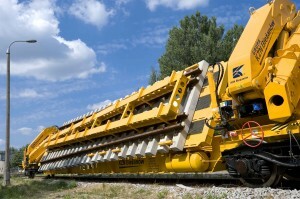 The technology dedicated to transporting the railway turnouts developed by Kolejowe Zakłady Nawierzchniowe “Bieżanów” Sp. z o.o. is an innovative solution guaranteeing the high initial quality of turnouts to be incorporated into the track. The system protects the turnouts against deformation and damage during loading at factory, transport and unloading. The basis of the system are specially designed and constructed cars integrated with a safe and precise lifting system and fitted with modules for fastening and stiffening the turnouts during transport and handling. This patented innovative and unique concept transport system was developed by KZN Bieżanów Research and Development Division. KZN focused on the problem in a wider context and the task was to ensure the highest initial quality of turnouts to be incorporated into the track. Special attention was paid to turnouts dedicated to high speeds which can be distinguished by their significant length. 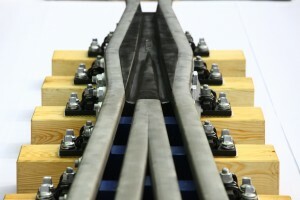 The complex approach resulted in development of a logistic model which will allow to transport long turnout components such as the entire switch blocks, connecting rails and common crossings for Rz 1200 type turnouts. This allows to limit the scope of works to be carried out on site. The innovativeness of this design was noticed by the Polish National Centre for Research and Development which decided to co-finance it from the public funds (action 1.5 OP IE in the Innotech III programme, In-Tech path). It is noteworthy to mention two patent applications to the Polish Patent Office and international patent application in PCT mode. The high usefulness of this solution arises from the fact that the car with a turnout attached does not exceed the loading gauge, and operation of cranes on site does not require the overhead lines to be removed. What is even more important, the KZN’s transport system based on rail cars allows to transport the turnouts dedicated to hight speed track systems, including the turnouts with the radius of R1200. It has a nose made from cast steel with a bainitic structure welded directly to the nose rails made from rail steel with a hardened head . The nose is positioned between the side rails, also made from rail steel, and the complete frog is bolted with high tensile, bearing-type bolts. easy welding and pad welding. Rollers are devices that extend the durability of turnout elements. They also facilitate and lower the costs of turnout operation. The principle of their operation depends on lifting the blade, which is shunted from a switch-point saver by approx. 2 mm over the surface of the slide seat. At the same time, the blade pushed close to and supported on the roller moves off the roller and rests on the seat of a slide shim at the moment of contact with the switch-point saver. Blade rollers from KZN do not transfer any forces related to the rolling of wheels of vehicles through the turnout switch.